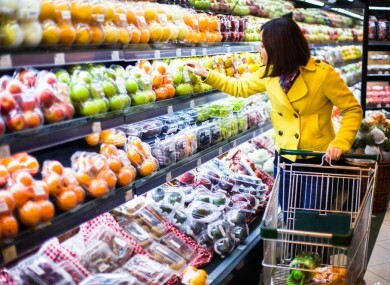 Irish shoppers spent an extra €92 million on groceries over the festive period. SHOPPERS IN IRELAND spent an additional €92 million on groceries over the Christmas period, 3.8% more than the same period 12 months ago. The figure is included in the latest supermarket share figures from Kantar Worldpanel in Ireland, published today for the 12 weeks ending 1 January 2017. Kantar said the fact Christmas Day fell on a Sunday in 2016 may partially account for the increase in spending as shoppers had two extra days to buy groceries. The average household spend was €193, €35 more than last year. Friday 23 December was the busiest day for retailers, with 55% of the population going to supermarkets on this date. Supervalu was the most popular supermarket, increasing its market share to 22.8%. It was followed by Dunnes Stores, Tesco, Aldi and Lidl. David Berry, director at Kantar Worldpanel, said: “With shoppers willing to fork out more over Christmas, it’s a vital time of year for grocers – an opportunity to pull away from the competition. Whether that’s via a heartwarming Christmas ad or the best premium own-label offers for the big day, we’ve seen retailers going all out to persuade the Irish public to shop with them this festive season. Despite a return to second place, Dunnes Stores continued to perform well. Sales for the Christmas period were almost 5% higher than in 2015 and the average spend per trip reached a new high of €41.60, significantly ahead of any other retailer. Tesco continued to improve its performance, with sales growing by 1.3% over the final quarter – up from the 1.2% growth the grocer saw in the 12 weeks to 4 December 2016. Elsewhere, Aldi posted the strongest growth of all Irish supermarkets, with sales up by 5.3%. The retailer managed to attract 37,000 new shoppers this Christmas, boosting its market share to 10.5%. Lidl also recorded positive results, with festive sales 2.3% higher than in 2015. Email “SuperValu wins the Christmas supermarket war ”. Feedback on “SuperValu wins the Christmas supermarket war ”.